Their long-awaited report, published Nov. 19 in the journal Nature, suggests why studies in mice cannot always be reproduced in humans. Importantly, the scientists say, their work also sheds light on the function of DNA’s regulatory regions, which are often to blame for common chronic human diseases. Almost all human genes have a clearly related gene in mice, which makes mice a good model for studying questions in biology that cannot be studied in human beings. But protein coding genes make up only 1.5 percent of either genome, analysis shows, accounting for the fact, for instance, that the history of drug development is littered with compounds that cured rodents but failed in human trials. The reasons for these failures — and why people don’t have tails or whiskers — likely lies outside of our genes, Beer explains, in the regulatory regions, which compose a larger fraction of the genome, but are less “conserved” — or similar — in mice and men. To delve into the details of those regions, the team analyzed 124 types of mouse cells and tissues, including brain, heart, blood, kidney, liver and skin. Together, the consortium generated more than 1,000 datasets representing regions of DNA where genes were active, where the DNA was open and accessible, where specific proteins were binding to DNA, and where DNA replication was happening. To exploit the information in similar datasets previously created using human tissues, Beer developed a mathematical tool to compare all of the datasets and identify the most similar and most rapidly evolving regulatory regions in mice and humans. The analysis showed that while mouse genes involved in core intracellular processes, like protein production, have activity patterns very similar to those in humans, the activity profiles of mouse genes involved in processes at the surfaces of cells are quite different — a finding with broad implications for researchers using mice to study cell-to-cell communication, immunity, cardiovascular disease and a host of other disorders, Beer notes. 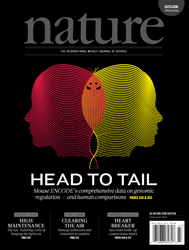 “Evolution has carefully preserved the regulatory sequences for the most fundamental core cell processes, but has left the rest to change as each organism required,” he says. Surprisingly, comparing all of the gene activity patterns from the cells and tissues of mice and humans, the team also found that any two tissues in mice were more similar to each other than to the same tissue in humans. For example, at the level of gene activity, gene patterns in the mouse brain are more similar to gene patterns in the mouse intestine than they are to patterns in the human brain. Beer says this means that, throughout evolution, a lot of genetic changes occurred at the organism or system level, independent of particular tissues. But when the team was able to “hide” those global changes mathematically, the mouse and human gene activity patterns for matching tissues are again alike. The mouse dataset used in the summary report in Nature has been online since 2012 and is regularly updated with more information. The other principal investigators of the report include Bing Ren of the University of California, San Diego School of Medicine; Ross Hardison of Pennsylvania State University; David Gilbert of Florida State University; Thomas Gingeras of Cold Spring Harbor: Roderic Guigo of the Centre for Genomic Regulation and UPF, Spain; Michael Snyder of Stanford University; and John Stamatoyannopoulos of the University of Washington, Seattle. This work was supported by grants from the National Human Genome Research Institute (R01HG003991, 1U54HG007004, 3RC2HG005602, RC2HG005573, U01HG004695), the National Institute of General Medical Sciences (GM083337, GM085354), the National Cancer Institute (F31CA165863), the National Institute of Diabetes and Digestive and Kidney Diseases (R01DK065806), the National Institute of Child Health and Human Development (R01HD043997-09), the National Heart, Lung, and Blood Institute (F32HL110473, K99HL119617), the Spanish Plan Nacional (BIO2011-26205, ERC 294653), the National Science Foundation Graduate Research Fellowship (DGE-071824), the Wellcome Trust (095908), and the European Molecular Biology Laboratory. Michael Beer has no competing interests to disclose.